An estimated 25,000 people have fled escalating violence over the last six months in eastern Syria, where die-hard jihadists are defending their last bastions, the UN said Friday. 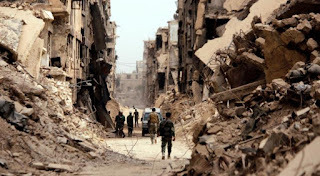 Much of the unrest has been centred around Hajin in Deir Ezzor province, which had been the last town of note controlled by the Islamic State group in the area until it was taken in December by the US-backed Syrian Democratic Forces (SDF). The United Nations refugee agency said that clashes and air strikes have forced 25,000 people to run and seek shelter in camps or informal settlements, sometimes after spending several nights in the desert exposed to harsh weather and without access to food or water. The agency also warned over "mounting civilian casualties" in the area, without providing figures. An estimated 2,000 civilians remain trapped in Hajin, where conflict continues, the UN said. The SDF is currently flushing out the very last pockets of land controlled by the jihadists in the Euphrates River valley. The US-led coalition that is supporting them in the area said Friday that it had begun withdrawing its troops, following a shock announcement from US President Donald Trump.